Description: NS local G93 working Birdsong Peanut in Blakely GA. Description: H-65 swings off the Lehigh Line to run the Washington Secondary at CP-Phillipsburg. Description: Two GP38-2s pull a cut of cars out of the yard. Description: Southbound at Milton on main track to pick up cars at Northumberland, Pa. 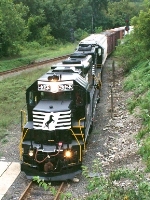 Description: NS H3W southbound at Sunbury, PA. Description: NS H3W southbound in downtown Sunbury, PA. Description: NS H2W crossing over the Susquehanna River. Description: With a short train in tow H2W scoots northbound behind the 537 just below MP 215. Description: On the main track in Nisbet now the H2W rolls northbound towards Lock Haven. Description: Darkness has fallen upon South Williamsport as H2W knocks down the old Pennsy signal at MP 219. Description: At MP 219 H3W runs southbound with no freight under beautiful blue skies. Description: With two GP38-2's running long hood forward the 550 heads down to the Buffalo Line towards the Selinsgrove Industrial. Description: Heading over the Susquehanna River now the 550 is not far from its destination at the Sunbury Generation Station. Description: Coming north through South Williamsport H3W is long today and has an ex. BN leaser helping out. Description: Train took the front end off a truck when it tried to beat the crossing. Route 54 crossing near the Strawberry Ridge power plant. Description: A yard job does some work on the east side of the yard. 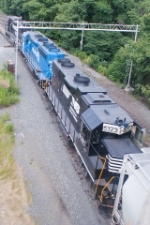 NS GP38-2 5217 leads Conrail Quality painted GP40-2 3057, and NS GP38-2 5323. Description: Eastbound 38Q caught me by surprise, seen in Grantham with a great lashup. Description: About when NS 6800 pass me. For whatever reason the crossing gate will not coming up. People who travel thou the road at Carneys crossing was going around the gate. I want to head up to lilly get a train. On my way up to lilly NS 6800 was sitting there waiting make her move. What stop me from going on top bridge of town of lilly was CNW cover hopper. I want to take that picture of CNW. So we return back to road head back to Carneys Crossing. Over the radio that a helper was holder up the rest of train because he cant unknuckle away from the train. This all take place at CP MO. The helper did on go into the sliding from other trains to pass. Later on i am happy get picture of this smoking NS engine.